It is sometimes said that Parker only made one pen with a lever fill and that was the Parkette. That’s not quite true. There was another, though it did not bear the Parker name. The Parkette was withdrawn in 1939 and the Writefine was introduced in 1940. This was a very low cost pen at $1, but the quality is surprisingly good. The plastic that it is made of has some heft to it and it feels strong. It reminds me of the material that the Parker 51 is made from. The trim was originally goldplated or perhaps I should say gold washed. A little remains on the cap ring but it is pretty well entirely gone from the clip and the lever. That aside, this pen with its gold coloured metal clip screw, ink-visible section and general air of restrained good quality was a whole lot of pen for the money. 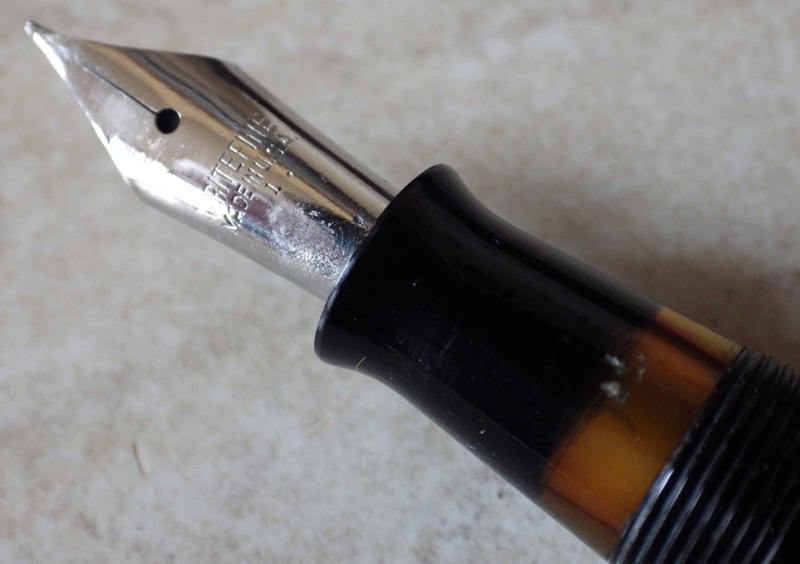 It has a steel nib which may originally have been goldplated but certainly is not now. However it’s not one of these cheap nibs with folded tips. It has a good blob of tipping material. This pen had been dropped and the nib was buckled at the tip. With my new nib repair tools (http://wp.me/p17T6K-12d) I was able to get it back to something like its original state. These pens had a short production run, so not all that many were made. They are not at all common in Britain and in fact this is the first one I’ve had. I believe there was a Writefine desk set too. I find the quality to be higher than that of the Parkette or the Challenger, which it resembles in many respects. It’s not actually a Parker of course. The barrel imprint is “Writefine Made in USA Writefine Co” so perhaps Parker did not respect it well enough to put their name to it. Nonetheless, it’s a surprisingly good pen considering its original cost.